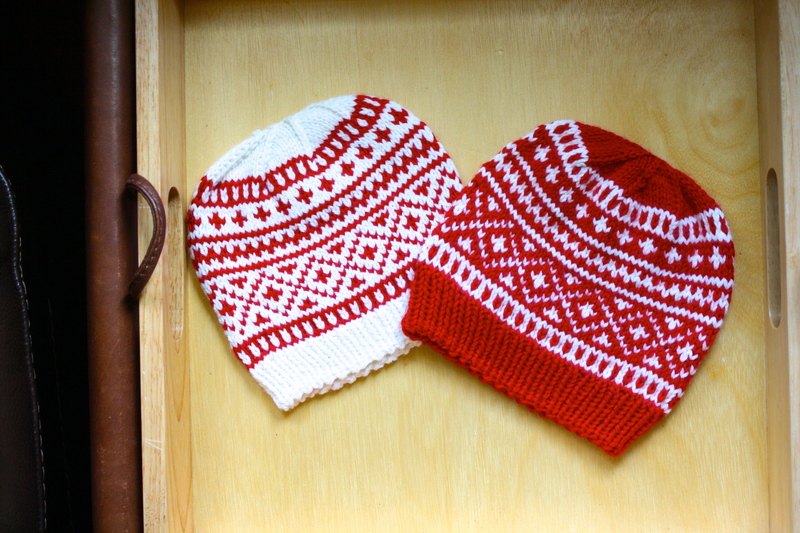 They’re Norwegian fair isle baby hats! 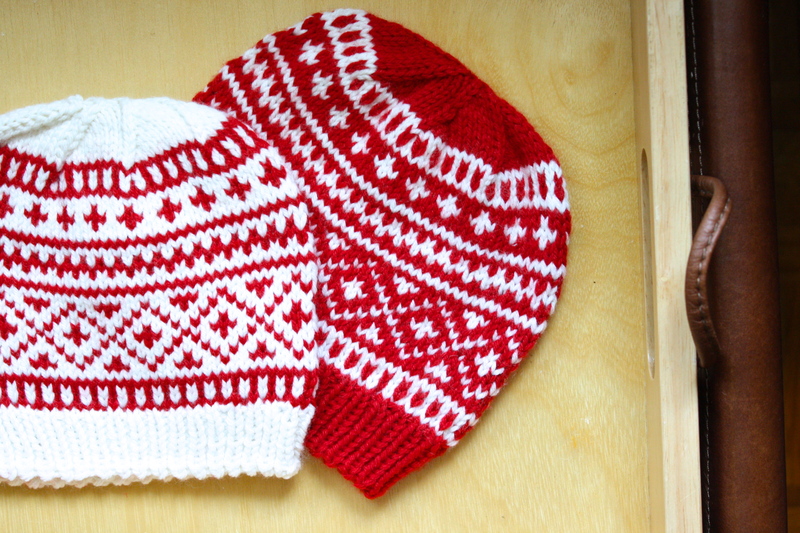 Okay, in all fairness (wow, I really need to stop using that word), I am not entirely sure that these hats are Norwegian in origin (HA. think about it…), but the designer of this hat says they are so I’m going to take her word for it. Anyway, if you’re a rookie knitter like me looking to pass yourself off as mildy to moderately skilled, definitely check out her site. Not only is the pattern super easy, but it only uses two colors, so you don’t have to break your wallet to buy 10 different skeins of yarn just to use a fraction of each. Also, this hat knits really quickly. I’m talking a matter of hours (depending on your love of Ice T playing a New York cop, you could finish this within three episodes of Law and Order, four if it’s a special one and the cast of Law and Order: CI or Without a Trace guest star as themselves). 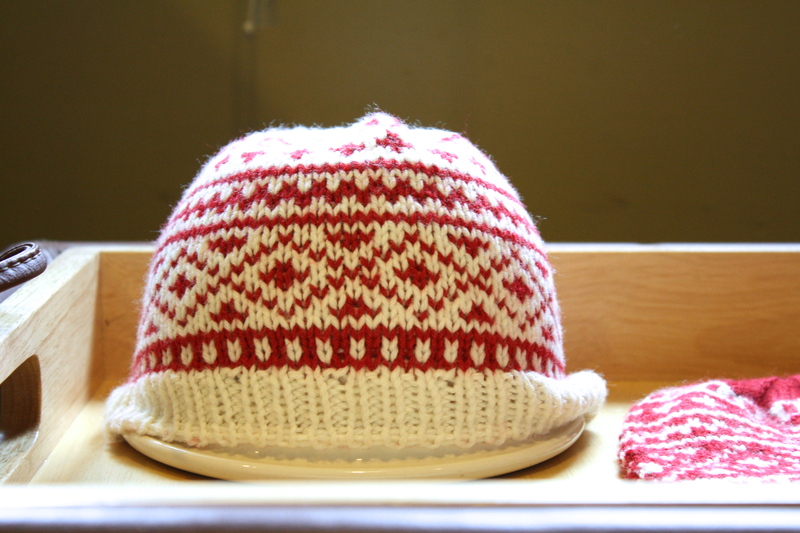 True, that’s mainly because these hats are small enough to only fit babies and small cantaloupes, but with such an amazing pattern like this, you just can’t stop yourself from making them! I wanted to provide you guys with pictures of how they look on an actual baby (mainly to attract the large community of internet users that Google “cute babies” to my blog), but, alas, I am without child. I considered asking random parent-child pairs from outside my house to model my hats for me, but after receiving a dirty look at Fenton’s the other day for touching a baby’s foot (from the mother, not the baby… in case that needed any clarifying), I decided against it. So, since I am currently deficient one infant, I used an appropriate (though infinitely more useful) substitute: a small mixing bowl! C’mon, you have to admit it. Besides the fact that his head would be halfway through an ottoman, this could very well be a baby wearing my hat. I actually went through several different options (saucepan, box of granola, bag of granola, tupperware of granola…) before I arrived at one that worked. 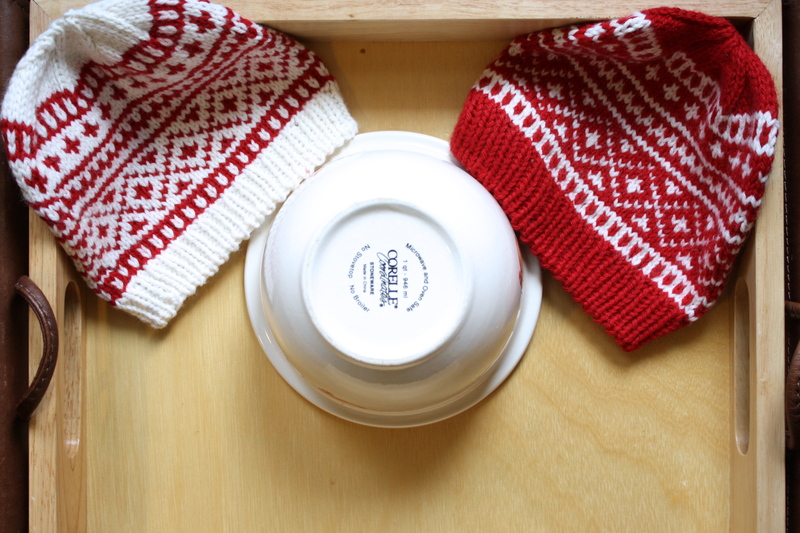 For those of you who are curious, that is a 1 quart ceramic mixing bowl (approximately the volume of a baby’s cranium, I’d assume) and perfect for modeling baby knitted head garments when no babies are at your disposal. So, as most of you may know, this blog is strictly speaking a knitting blog (with some bad pukns and self-aggrandizement thrown in for good measure). I’m not one for DIY life tips (except using those plastic bread clips as cord organizers. ingenius. ), fancy cooking recipes (though for a time I was smitten), or fitness videos (okay I did blogilates ONCE and it didn’t even count because I could only last the first 3 minutes). 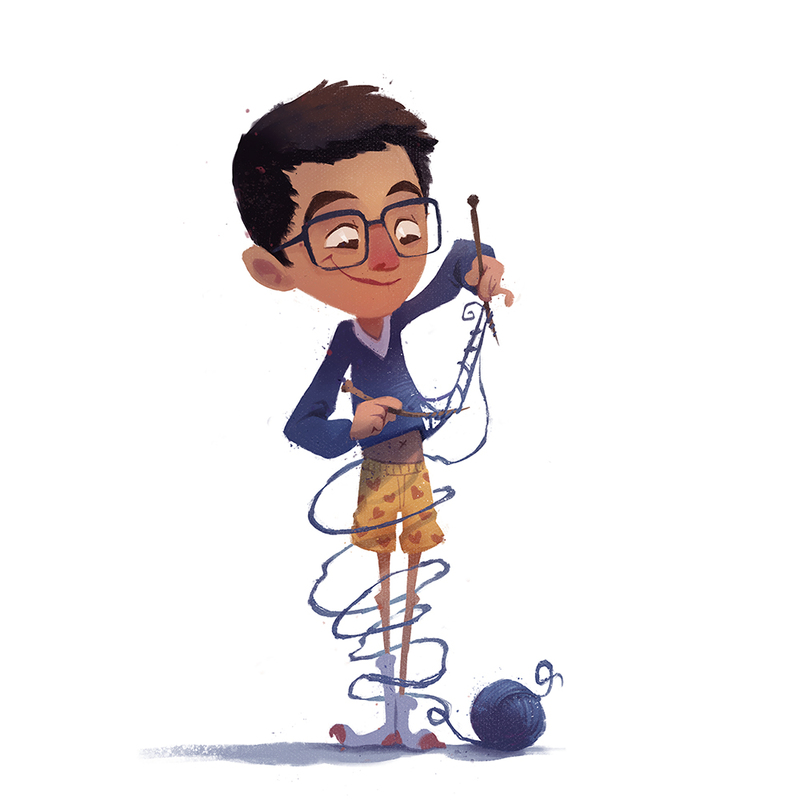 I like to keep things simple and just have knitting be the common thread throughout my blog. However, recently I’ve been developing a sweet tooth for travel and am considering taking a long, incredibly impulsive trip to somewhere in the world where I can’t see the Bay Bridge. This exploratory impetus took me somewhat by surprise, but looking back, I can see how it’s been slowly gaining momentum. In the past few months, I’ve developed habits such as looking up costs of random flights (Budapest –> Ukraine for $232.89. book it. ), trying to list every country with my friend via text (I’ve always wanted to be that guy who could fill in Burkina Faso and Niue in Sporcle), and figuring out where in my room I could fit a massive world map. And, like most money-minded post-grads planning on embarking to an unknown land for an extended period of time, my first concern about this trip was masculiknity (that’s how I refer to my blog in my head. telling much?). Well, fear not, gentle readers. I won’t turn this blog into a series of hi-def photos of horizons and waterfalls that make you wish you were out living and not stuck at work staring at a computer screen. Pinterest does enough of that. To be honest, I’m not entirely sure what will happen. Maybe I’ll leave à la Julia Roberts and Eat, Pray, Love around the world (I have no idea what I just said, but the reference seemed appropriate). Or perhaps this will be a trip of self discovery and I’ll blog about how I learned who I truly am and what my purpose on this world is (nah, I’m way too self-actualized for that). Ooh, or maybe this could be a bucket list kind of trip where I write about doing all the things I’ve always been too afraid to do (like eating dairy before 10am or trying Sriracha). On second thought, I’ll probably just go to Norway and see what their hats look like. ***Niue, an independent island country in the South Pacific Ocean, was the world’s first in making wireless internet free and readily available throughout the entire nation.